The Quizzical Glance: Two Centuries of Women Cartoonists in Britain with Nicola Streeten. ​Marie Duval – rediscovering a forgotten comics genius. Marie Duval – rediscovering a forgotten comics genius. Sterling Maxwell Centre, University of Glasgow. Adapting a Victorian classic. Talk. Nottingham University School of English. Dispossession. Talk and book signing. ​Comics workshop for all ages. See here. Dispossession: adapting Trollope. Talk and signing. "Leaving Britain" – emigration in the Victorian Age, with Jude Pliese. Talk and book signing. In conversation with Stephen Amarnick, editor of the excellent restored edition of Trollope’s The Duke's Children. 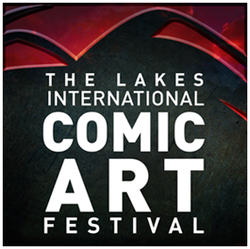 Lakes International Comics Festival, Kendal. With Evie Wyld and Paul Gravett. London Lit Weekend, Kings Place, London. With Jonathan Keates, Helen Small and John Sutherland. UK Launch of Dispossession. With window painting. 'With David Skilton, Emeritus Professor of English at Cardiff University. 18 November 2014. Cardiff Centre for Editorial and Intertextual Research. Creating a visual replacement for Trollope’s literary voice.